The new year brings not only goals for your finances and fitness, but for your food, too. It’s easy to follow a workout with a large meal or some quick take-out or fast food and justify it by calculating the calories you just burned, but there is a quick and healthy alternative. 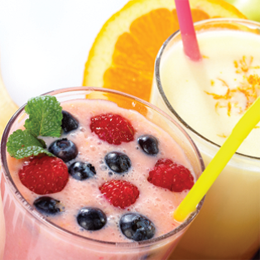 Awaken your taste buds with a post-workout smoothie. Eateries across the region are offering vitamin packed, flavorful and protein-equipped smoothies to fill you up while also helping provide your body with the nutrients it needs for your muscles to recover. Whether you are a powerlifter who just hit a new PR or a runner going the distance, these smoothies are just what you need to balance your workout. If you have a well-balanced diet, this smoothie will give you the trifecta: fruits, vegetables and protein. Carrots and oranges are blended with Amino’s greens and proteins to produce the Greensicle smoothie. This specialty blend is designed to bolster the immune system, lower cholesterol and increase energy levels—and bring us back for more. What’s better than a healthy substitute for a guilty-pleasure treat? That’s right, nothing. Leaf hands us our favorite fall treat via blender by mixing banana, apple, dates, cinnamon and a choice of almond or soy milk to give us their Candy Apple smoothie. An added benefit: no sticky hands. Known as the tropical “super fruit,” acai berries are at the heart of almost every health nut’s diet regimen. The fruit is also the star of one of b.good’s smoothies. The Acai Berry smoothie hosts the super fruit, blueberries, pineapple, banana, almond milk, chia seeds and lemon to serve up a smoothie that won’t disappoint your taste buds. Doctors—and our mothers—always told us to eat our greens for a healthier diet. You can finally listen to them with the help of The Green Supreme. The Juice Bar mixes kale, spinach, cucumber, lime, apple and spirulina (a natural “algae” powder high in protein and antioxidants) for a smoothie that packs a punch of added benefits and flavor. The leaf cabbage that is high in fiber and water—making it health gurus’ favorite green— finds itself the center of attention in greenplate’s Kale-Abunga smoothie. When combined with almond milk, banana, cinnamon and honey, the kale is transformed into a delicious treat that will make you feel like you’ve rewarded yourself for a workout well done. If you’re like us, you are hard-pressed to give up chocolate during your diet. Luckily, Heart Beet Kitchen knows the feeling and created the Cherry Chocolate Bomb smoothie. Cherries, dark cacao, cacao nibs, vanilla extract, agave, dates, almond butter and milk are blended together to create a treat not far off from our favorite chocolate milkshake. Can we supersize this? For a post-workout drink that tastes like a dessert, we take a trip to Red Mango. Blending their Original Nonfat Yogurt with all-natural peanut butter, banana, Ghirardelli dark chocolate, organic dark chocolate mate, Metabolic Fit 360 Boost and Stevia All Natural Zero Calorie Sweetener by PureVia, it’s easy to imagine this as a decadent dessert. It may not be a Reese’s Peanut Butter Cup, but it’s close.